This weekend has been one of the most exciting in my short career as a knitting designer. Why? Because the latest issue of Yarnwise is out and I have a pattern in it! Back in November, I saw a post on Ravelry by the editor of Yarnwise looking for last minute submissions for their Winter/Spring issues. I usually ignore submission calls because the deadlines rarely work well with my day-job and studying and, well, the rest of my life. 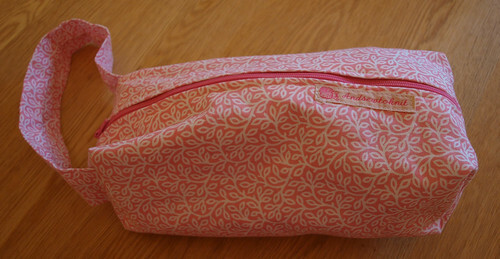 However, I realised that for this one I had a pattern already mostly designed that fitted one of the themes really well and I had a few days booked off work that I’d be able to spend tweaking the design and actually writing the pattern. 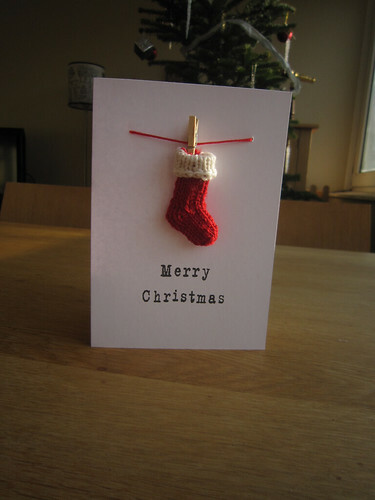 So, I knitted up a swatch/sample, put a submission together, sent it in and the rest is history. I’ll do a full “Story of a design” post at some point but for now I’m too busy grinning at seeing my pattern in print! 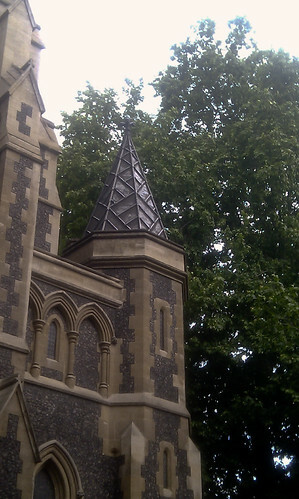 When we lived in London, my train journeys regularly took me past Southwark Cathedral. 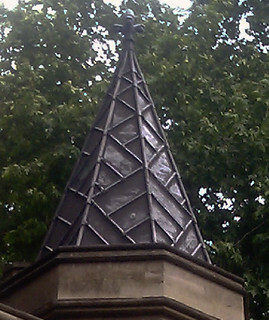 It’s an impressive building from all angles but I was always fascinated by two of the spires which are leaded with a beautiful geometric pattern. 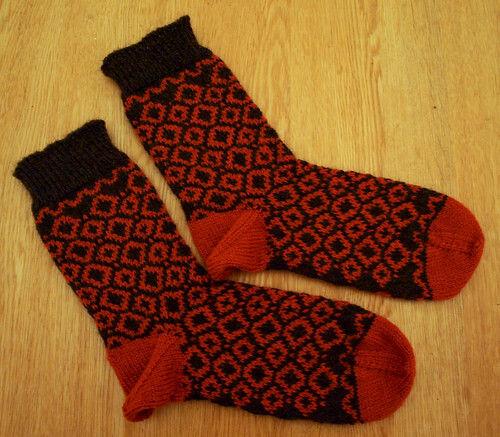 Southwark Spire Socks are now available from Yellow Ginger Designs and Ravelry. I had a wonderful day at the Glasgow School of Yarn the weekend before last. 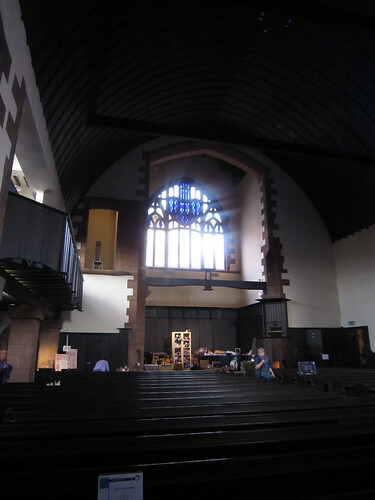 For the second year running, it took place in the beautiful Queen’s Cross Church, designed by Charles Rennie Mackintosh. It’s not the ideal venue for a knitting event but well worth a visit on its own merits. I couldn’t make it along on the Friday but signed up to take Woolly Wormhead‘s hat design class on the Saturday. She brought a huge selection of hats for everyone to try on to judge what style would suit them best and then we got stuck right in to measuring each other’s heads, calculating gauge and working through the maths for our hats. Much frantic knitting then ensued (particularly from me since I had not read the joining instructions carefully enough and brought lighter yarn than was really sensible) as we raced to get as far through our hats as possible. 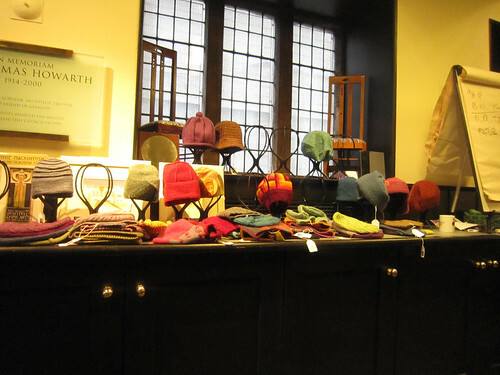 It was a great class and I learned a lot about hats and hat design that will no doubt show up in future patterns. I don’t have a picture of my own hat (which is just about finished) but here are some of the selection of her own designs that Woolly brought with her. 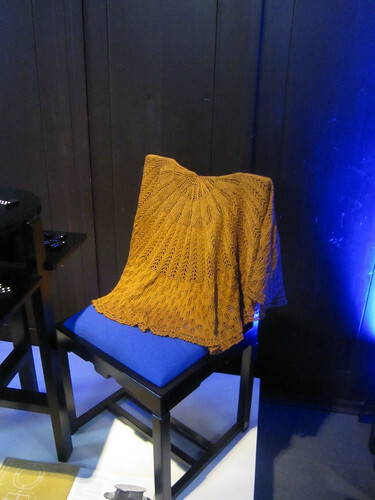 … for a new shawl project using the yarn that I bought from Old Maiden Aunt. 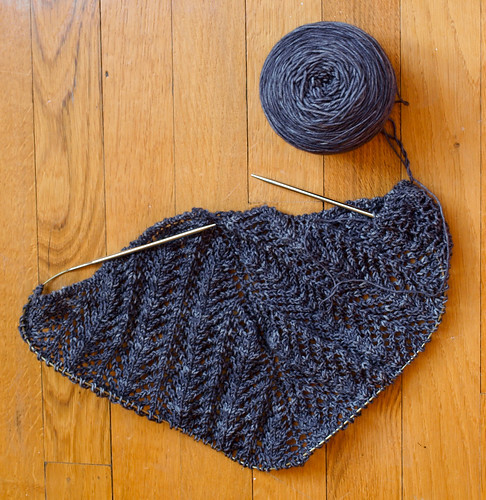 The pattern is my Oren Shawl pattern and this one is going to be for wearing under my coat. I’m making some final tweaks to the pattern before it goes for editing but it should be available in the next couple of weeks. 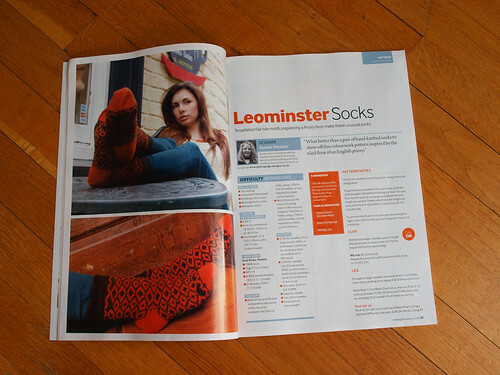 I’m in the Patternfish August newsletter! 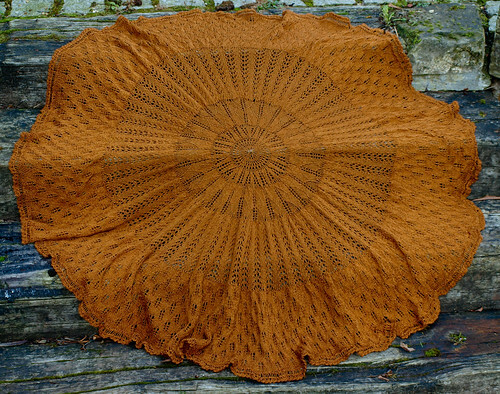 My Oren Shawl is part of the collection of the month in this month’s Patternfish newsletter, one of sixteen lacy shawls to knit while the weather is still warm. I’m really chuffed to be included, particularly given some of the other designers that are featured – go take a look! Before Christmas, a company selling a certain brand of Irish stout ran an advertising campaign which implied that men would much rather receive beer as a present than hand-knits. While I know that that is probably true for a lot of men, it’s not true for the men in my family — they would rather have beer and hand-knits, and these socks were my attempt to combine the two. 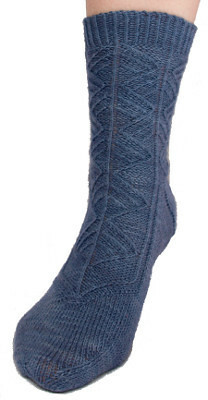 The socks are knitted from the toe up with a simple cable pattern that keeps the knitting interesting and makes for a snug, stretchy fit. The pattern includes 4 sizes with adjustable foot length and sock height so should fit all but the smallest or largest feet. 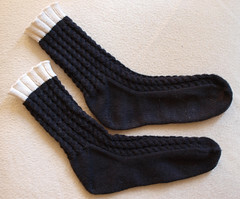 Irish Stout Socks are now available from Yellow Ginger Designs and Ravelry. 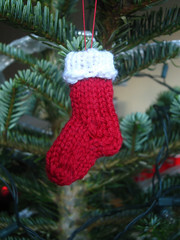 As promised, here is the pattern for the mini stockings. 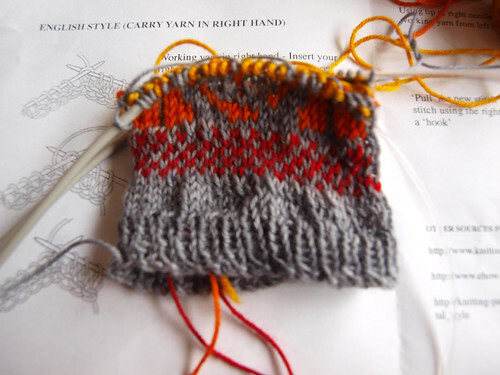 They are worked from the toe up with a short-row heel. Some experience with short rows and toe-up cast-ons would be useful but I’ve included links to good tutorials on both if you need some extra help. This pattern hasn’t been edited or tested by anyone but me yet so let me know if you have any problems. Round 4: * K1, m1, k2, m1, k1. Repeat from *. (12 stitches). Row 12: Purl 4 stitches. Wrap next stitch and turn. Row 13: Knit 3 stitches. Wrap next stitch and turn. Row 14: Purl 2 stitches. Wrap next stitch and turn. Row 15: Knit 2 stitches. Pick up wrap and knit next stitch. Wrap next stitch and turn. Row 16: Purl 3. 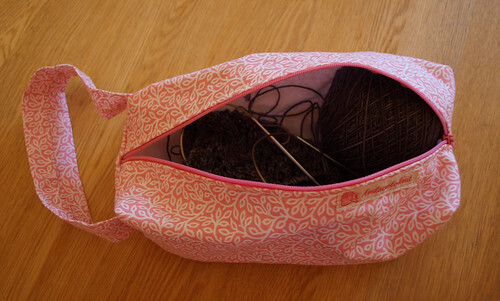 Pick up wraps and knit next stitch. Row 17: Knit 4. Pick up wrap and knit next stitch. Wrap next stitch (leg stitch). Row 18: Purl 5. Pick up wrap and knit next stitch. Wrap next stitch (leg stitch). Row 19: Knit 6 stitches (back to end of row). Round 20: Knit all stitches, picking up wraps on 1st and 6th stitches. Rounds 21-30: Knit all stitches. 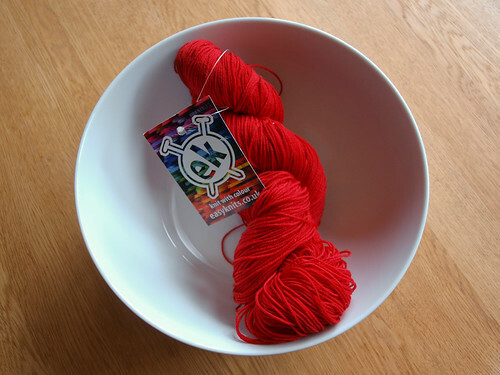 Change to contrasting colour and turn work so that you are knitting in the opposite direction. Rows 31-35: Knit all stitches. Cast off: Knit 2 stitches, place two new stitches back onto left-hand needle and knit these two together. 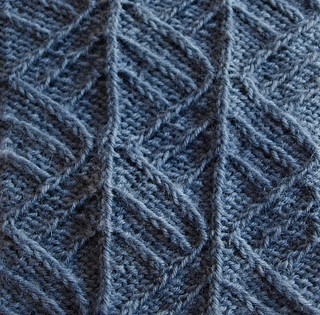 * Knit one stitch, place two new stitches back onto left-hand needle and knit these two stitches together. Repeat from *. … which is somewhat unfortunate since I would swear November was only moments ago! A combination of illness, craziness at work and just no energy whatsoever (see points 1 and 2) has meant that I’ve done very little except work, eat and sleep for the past month. I do have quite a lot of knitting to show you though, starting with my current addiction: mini toe-up seamless Christmas stockings. They’re my own design and, if my brain cooperates, I’ll put the pattern up sometime tomorrow. Considering that this turned out to be the quickest I ever managed to get a design from initial idea to published pattern, this design came very close to not happening at all. I grew up in Glasgow surrounded by the work of Charles Rennie Mackintosh and, if I’m honest, had grown a little jaded with it by the time we moved to London thanks to the proliferation of Mackintosh-inspired tea cosies, tea towels, fridge magnets and place-mats. When I saw the brief for the Glasgow School of Yarn design competition, I was sure I wouldn’t be able to come up with something that I thought was worth entering but I couldn’t stop mulling it over. Then I thought about how much I had always loved the simple elegance of his furniture and, in particular, the chairs. A little online research led me to the tall, narrow ladderback decorative chairs that he designed for The Hill House in Helensburgh. Click here to see a picture of one of the chairs in its original location. Initially, I was going to use the geometric pattern in a sock but, much as I loved the pattern, I just couldn’t get it to work as a sock. 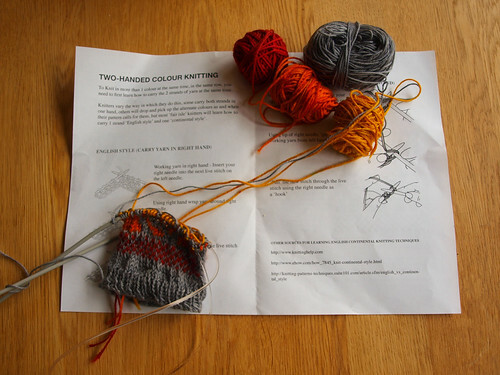 A scarf was the obvious alternative and the two-colour pattern immediately suggested double knitting. I used Malabrigo Sock in Natural and Chocolate Amargo for the sample and it’s wonderfully soft and snuggly. The double layer also makes it very warm, perfect for autumn and winter in Glasgow! The Hill House Scarf is now available from Yellow Ginger Designs and Ravelry.